How wonderful to finally have some sunny days this summer! How wonderful to finally have some sunny days this summer! My family and I have been making a concerted effort to get out and about in the great English countryside recently and last weekend we visited Avebury in Wiltshire. 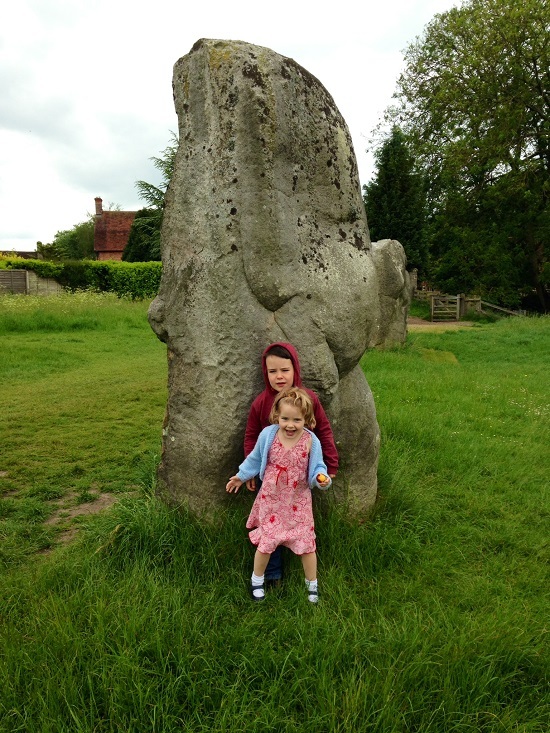 If you fancy venturing out of Bristol with the kids this summer, I recommend visiting Avebury as it offers a fantastic day out. We had a great time exploring Avebury's stone circle, picnicking under one of the huge standing stones and then visiting the Manor House. Avebury Manor was probably the most fun part of our trip as it differs from most other stately homes, in that children are actively encouraged to touch everything! My kids were invited by the volunteers to open drawers to discover what was hidden inside, pick up the interesting items and objects within the house and even get into the four poster beds! My kids had a great time, all the while learning about Tudor times and the Art Deco period. My son is still enjoying Beavers, especially working on gaining badges. He has just started working on his Gardeners Badge which has included him planting spinach and lettuce seeds, learning about the different changes to trees throughout the seasons and learning how to use garden tools safely. I really like how the work necessary for gaining badges is useful as well as fun. My little girl is due to start school in September and to say she is excited would be an understatement; she has actually been excited for well over a year now and is more than ready to start! However, we will still be sad to say goodbye to the staff at Magic Dragon Pre-School, the wonderful pre-school at the Church of the Good Shepherd on Bishop Road, Bishopston, which my daughter has been attending since before she was three and where my son went before he started school, too. The staff at Magic Dragon are patient, wise and very kind and put so much effort into making each and every child's experience the best one possible. If you are looking into pre-schools for your child, I would wholeheartedly recommend Magic Dragon – please email magicdragonpreschool@hotmail.co.uk or phone Miriam Lord on 0117 9243446 / 07791 659 967 for more information. While on the subject of Magic Dragon Pre-school, I must give a shout-out to Dhao Pardoe who has been working at Magic Dragon since 1994 and been pre-school leader since 1996. She is retiring from Magic Dragon this summer and will be hugely missed by staff, parents and children alike.